These days I find myself trying to find more utility apps and less gaming ones. One I stumbled on a few weeks ago on the r/android subreddit was AirDroid. So simple in concept – I facepalmed myself asking why I hadn’t sought it out sooner. I was already tired of having to connect my phone to the PC every time I needed to transfer a file. Especially if it was something really small like a picture of a doc file or a pdf or a ringtone or something like that. AirDroid is definitely one of the most utility providing apps on the store right now. Tap the little paper plane icon on the phone. AirDroid. 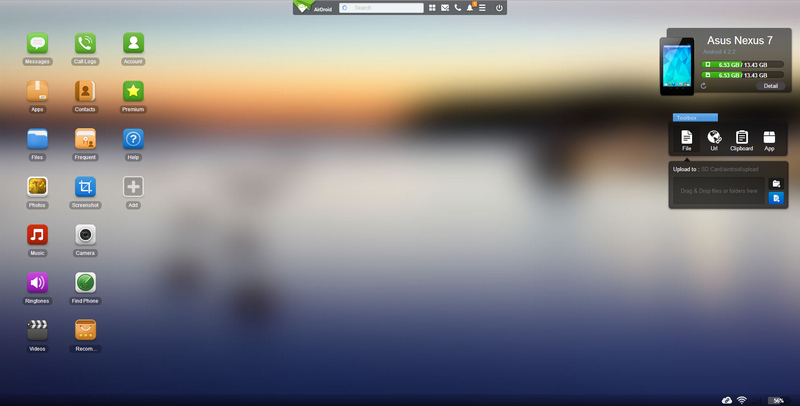 As soon as it’s done signing in on your phone, open up a browser on your computer and type in web.airdroid.com – the page loads and detects your phone through LAN instantly creating a bridge between your computer and your smartphone. Watch as pretty much every single detail of your smartphone is displayed onscreen. Phone make and model. Storage space, network and battery health. You can access your messages, your call logs, your collections of photos and videos. Your ringtones and files and your screenshots. In fact, even while being one of the best apps I’ve used it has little to do on your phone itself – the app is just there to act as the bridge. One of the best things about using AirDroid is that it removes the necessity for using a cable to connect. You want to install a ringtone? That’ll take you around ten seconds. You can send messages, you can check out your apps, uninstall them, and install some by dragging and dropping on one of the options. You can take a screenshot of your android screen, send text to the device’s clipboard for pasting purposes. If you decide that you like what the app has to offer, you can go premium which lets you transfer larger files as well as control your camera remotely which I feel like would be a nifty feature. To be honest though, right at this moment I can’t think of any situations where I might need to do this. But hey, it’s still pretty cool. Sharing AirDroid on Facebook and Twitter actually gives you two months of premium member for free (though it’s said to be a limited time offer for now). AirDroid is a simple and effective solution to connectivity with your desktop, whether it’s to transfer files or to sort through contacts and messages from the comfort of your computer. I cannot recommend this app enough. Shahriar Emil is a UX Designer and part-time author. He loves technology and gadgets but has fallen behind on the latest updates in recent times.